Q. 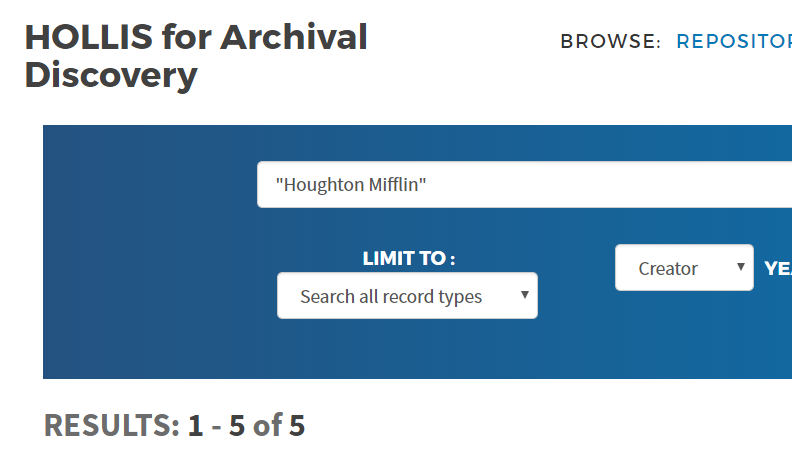 Can I access the archives of the Houghton Mifflin publishing company? Houghton houses the historical archives of Houghton Mifflin Co., including editorial correspondence, contracts, and 19th- and 20th-century business papers, and they are open for research. The archive does not include copies of Houghton Mifflin’s publications. Much of the 20th-century part of the archive remains uncataloged, but readers are welcome to look at all parts of the collection here in the Reading Room. We are unable to search for particular items in the unprocessed parts of the collection on a reader’s behalf due to its size and because much of the collection is stored off-site.